If you purchase this product you will earn 100-200 Points! Worth $10.00-$5.00! 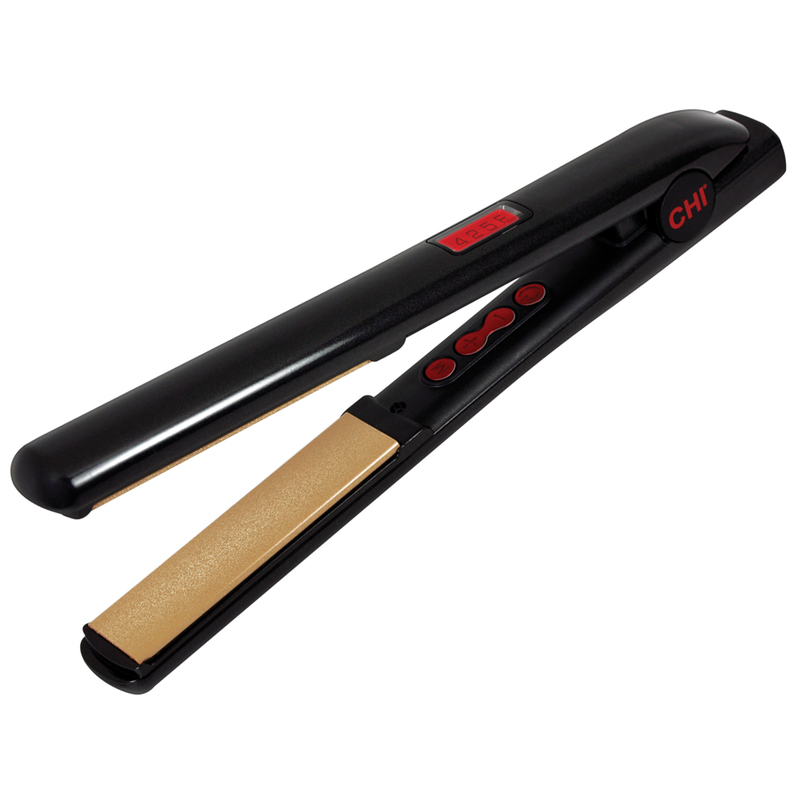 The dynamic CHI G2 Professional Flat Iron offers a sleek design, upgraded technology and outstanding performance. The CHI G2 features titanium-infused ceramic plates for added durability and an even smoother glide. Digital temperature reading displayed on a color-coded LCD screen allows for proper temperature setting for fine, medium, and coarse hair up to 425°F. LOVED my flat iron to death (this was me second g2). Only complaint and reason I can’t give it 5 stars is unfortunately after about 10 months, on of the plates fell out… I tried popping it back in but every time I ran it down my hair it came back out. SUPER bummed but hoping to saved up for a new one very soon. Forever a CHI fan. I absolutely LOVE this straightening iron! It doesn’t pull my hair like my previous straighteners have. I’ll never use anything but chi ever again! So far the absolute best straightener I’ve owned. Glides through my hair so smoothly, and looks so sleek and shiny when I’m done. I hope this one lasts as long as the other Chi straightener I’ve previously had. This is my 2nd Chi flatiron and I LOVE it! It heats up fast and then glides over my hair leaving it smooth and shiny looking. Since transitioning my hair from relaxed to natural I have been trying out different flatirons to get one that smooths and straightens without damaging. So far so good! Works great. My last one lasted for about 7 years until the cord tore. So far this one is doing great. Heats up very quickly. Very light and easy to use. I think this straightener looks great! Great item and a great price. My favorite product is the CHI G2 titanium infused hair iron! I thought it had broke one time so my husband bought me a different Chi iron. Then it turned out to be our outlet that was broken. So I returned the newer one. Lol. I stay loyal to the older CHI! CHI G2 because it adjusts to where it should be on its on own. Great Product! Bought this for my daughter, now I use it as well, I love it! I love this one won’t burn my hair and it dont smell bad. Love it. My hair is feezy and im done in 15 mins. I just bought this flat iron and love it. It heats up quick and stays hot and glides thru my hair does not pull or tug on my hair. Awesome product. Wife uses it almost every day and you can’t go wrong with CHI. She used cheaper brands in the past that didn’t work as well. This thing heats up fast and works perfectly. She has really thick hair and this thing straightens it without a problem. It stays hot and powers right through. This straightener is my life saver! It works so well and does not smell like others do. It has heat control temp, which helps the stage of your hair. It shuts off by itself after an hour of not being used, which is a PLUS. reasonable price and great product! This is the best flatiron! I have curly hair and I have never been able to get it this straight! Everyone thinks it’s naturally straight! I LOVE LOVE LOVE this straightener! I did research for months knowing that my flat iron was about to crap out on me and that I’d have to find a new straightener soon. Sure enough, my flat iron’s button broke off and I was no longer able to use it. I bit the bullet and ordered this CHI G2 and I can say that I am SO happy with my choice. I absolutely love this straightener. The different temperatures is a fantastic feature. The power button and temperature buttons are in a place that doesn’t get in the way while straightening/curling my hair. The black color of it is so sleek. It runs through my hair like a dream and never gets snagged! I’ve loved this straightener. It heats up quickly and I love all of the heating options. I keep it at 350 degrees-my hair is on the fine side and it isn’t thin, but not thick either. It’s high quality and does perfect job at straightening my hair without me feeling like I’m singing it. Highly recommend! I bought this Chi to replace my old one that died after after several years of use. I love this one! The larger (1 1/2″) plates and the different heat settings are perfect! I love, love, love it! From delivery to the packaging, to the elegant design and ease of use with precision temperature control, to the feel of it in your hand and how it glides effortlessly through your hair, you know this is top quality. I love it. I’ve been using it for a couple of weeks now, and my hair is so easy to manage and holds its style overnight. It reaches temperature in less than a minute. Not just straightens, it can even do back spiral curls and flips. Beautiful product.